Something about the scene at "Vietnam Restaurant" made me feel like a jerk if I didn't buy anything, so I ordered a Vietnamese Sandwich, a personal favorite. 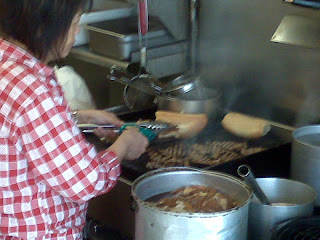 In the picture above, you can see the lady actually grilling my grilled pork after I ordered it. Wow. While I waited, I stretched. Then I threw the banh mi in my bag for later and was ghost. 10:59 - I've picked up the Getty and dropped the 3800 Washington. I'm starving so I break out the sandwich before checking in. I eat half, check in, and am told to call back in 10. Perfect. I eat the second half. The meat was good, but the bread wasn't all that. 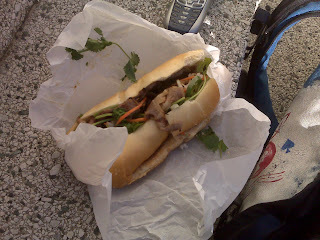 Saigon Sandwich is still my favorite. Sitting on some random steps way out in the Marina I see Christoph, a messenger from Western ride by. Unusual to see other messengers this far out. They're out here, working other company's longboards, but it's rare to run into one another, which made it weirder to see Fastboots at the end of the block ten seconds later. 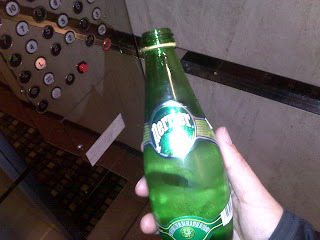 11:41 - Perrier! After standing by in the Marina for 20 minutes holding one package, nothing comes up. My dispatcher tells me to move in and clean up. 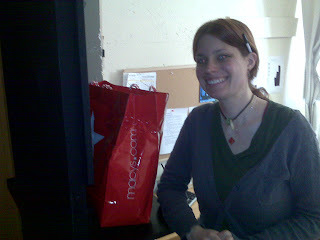 I drop off the Getty tag at Vallejo d Investments in 1 EC and being Getty-afflilated, I get laced up with fine French(?) water. I'm not really into it, actually. I prefer Evian in the bottle. 11:44 - Cookie! I hit up First Republic Bank, known (by me) for their free cookies. I've looked into it, and they actually make the cookies in the branch. 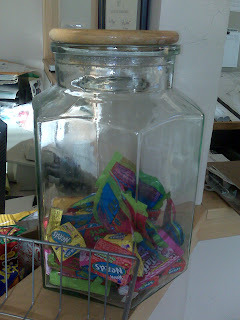 I used to love these things, but now, much like candy, I've kind of od'd. But they will do in a pinch. 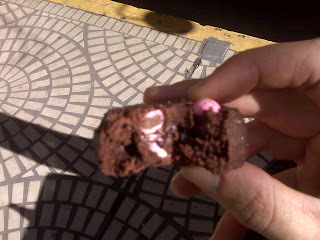 Chocolate with pink m and m knockoffs. Kind of a borderline hifi combo. 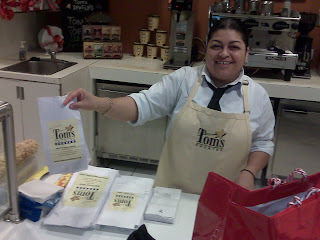 The one branch that doesn't make cookies in-house gets them delivered by our company daily from Tom's Cookies in Macy's. Love that bank. 13:32 - Yes, my clock is in military time. I am a nerd. After eating that last cookie, I'm given lunch. Not hungry of course. My dispatcher is nice enough to let me ride over to the DMV where I've been meaning to register this 1986 RX-7 I bought for $700 after seeing it on a flyer in Japantown during a lunchbreak last week. Hopefully I can flip it for around 2 g's. Surprisingly, the whole affair, riding there, waiting in the wrong, then right line, followed by more waiting and paperwork takes only 45 minutes. Hoping for a De Young tag since I'm right by it, but am told to head downtown to Tom's Cookies for a Fort Mason. About once every 1.5 months or so, I deliver a big bag of brownies to the Magic Theatre. Yeah, I don't know either. 13:34 - Wow, I'm using the photo timestamp on my camera to get these, which means I ate this in two minutes while walking downstairs2 to pick up the Tom's. At Tom's, they ALWAYS take care of me. But the lady below is extra nice. It was my third day there that week so instead of the usual free cookie, she gave me four and a bottled water. I saved these for later, gave two to the girl at the hotdog stand on my way back3. She said "thank you muchly" which was kind of cute, but also kind of theatery. 15:55 - I head back downtown and pick up three extra longboards. One from the YMCA at 653 Howard over to the YMCA on 1601 Lane in Hunters Point. Yes, that's hella far. It was the first beautiful blue day in a while, so it was a pleasure. I got a two great skitches on 3rd street. Glorious. 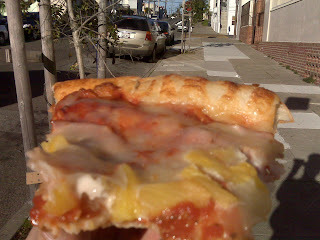 Anyway, at the HP Y, they gave me this slice of Hawaiin pizza. To be fair, I saw the box and asked. I felt bad when as I was leaving, I overheard some poor employee excitedly breathlessly ask "where did he get that pizza?" It was good though. 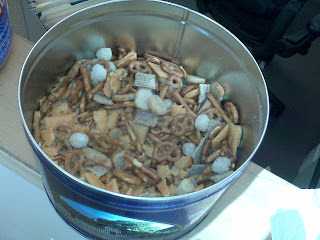 16:08 - RMR Construction at 2424 Oakdale always has various treats. I've dogged candy in previous posts, but I still have love for NERDS. 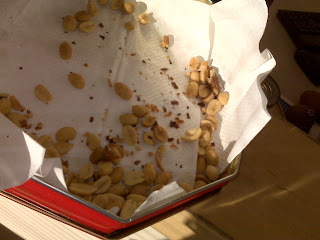 I grabbed some peanuts too. They also gave me some bandaids for the blisters on my heels from not wearing socks. The ladies at 220 Channel gave me some earlier, but they came off, as did the RMR ones not long after. So there you have it. 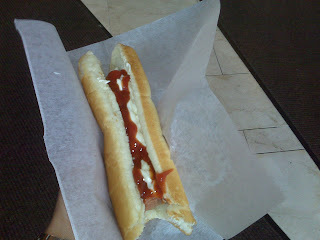 That's what I ate on Friday. It was a beautiful day. I rode all over the city on the longboard. 1: some random flickr photo of the cart in front of levi's across the park. only one I could find in a pinch. man, i'm really getting all david foster wallace on this entry. 3: actually, there were two people working the stand, so they each got a cookie. two people means either stan (my old boss) was expecting a busy day, or one of them is a rookie getting trained. 4: but not that much more. i'd say 35% of my days will see such varied food intake. 38% are "normal". what does that leave, 27%? 20% are stranger and 7% are extra-ordinary, like free sherry from Campton Place hotel (the one with the couch in the elevator on Post, next to Farallon) although that used to be a regular stop (free sherry for guests after 3pm or so) and steak. Got sick just reading your blog about all the crap you ate during the day, except for the Vietnamese sandwich which sounded (and looked) really good, but I loved reading about your daily intake just the same. Also learned about skitching. Don't tell your mother.